In Bruges? No, in brogue. The Guard is a fine cure for the late-summer blahs. Written and directed by John Michael McDonagh. With Brendan Gleeson and Don Cheadle. Now playing. The magical/absurd strain in Irish storytelling runs deep, all the way from pre-Christian Celtic myths to the glib menace of Martin McDonagh's plays. The lives of humans are forever complicated by the machinations of fairies, giants, bog men, and the occasional dead cat. Now comes Martin's brother, John Michael McDonagh, with the wry little tale of the country cop, the drug smugglers, and the American FBI man playing tag on the narrow roads of County Galway. It's called The Guard, and it's a fine curative for the late-summer blahs. 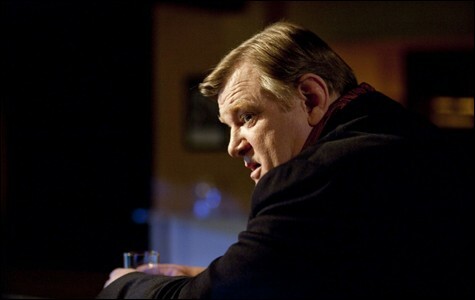 Anyone at all could see that Sergeant Gerry Boyle (Brendan Gleeson) is the trickster. He sits contented in his Garda uniform like a malevolent fat toad in a fable, pausing in his daily rounds to smoke a joint or cavort with a pair of prostitutes, with always one eye open for the main chance. It is the stock in trade of men like Gerry Boyle that people unacquainted with him will underestimate him. They do so at their peril, for there isn't a leaf that falls nor a stone that tumbles in Connemara that he doesn't have a line on. In the midst of investigating the mysterious murder of a fellow policeman, Gerry learns that a serious transatlantic cargo of cocaine — about $500 million worth — is heading for one of Galway's inlets aboard a ship called the Annabel Lee. Very poetic. Ready to greet the shipment are three crooks named Sheehy, Cornell, and O'Leary. Liam O'Leary (David Wilmot) is a moronic Dublin thug. Skin-headed Clive Cornell (Mark Strong), imported from England, likes to discuss Nietzsche with his mates. Francis Sheehy (Liam Cunningham) is the one you have to watch out for, not only because of his casual cruelty but because in any Irish or UK crime pic, actor Cunningham is always the nastiest of the lot. Oh, and did we mention that someone is selling stolen weapons to an IRA soldier who wears a cowboy hat? Into this stew steps FBI agent Wendell Everett (Don Cheadle), a long way from home and obviously dreading the assignment. Nice-guy Wendell can't get started. He gets stuck interviewing Gaelic-speaking locals and repeatedly fails to crack open Gerry's mock-dour exterior — it's mad fun watching Cheadle and Gleeson joust over drinks in a pub. In a routine, unimaginative kind of cops 'n' robbers flick, Wendell would overcome his fish-out-of-water disadvantage and rise to the occasion with heroics in the last reel — but thankfully The Guard is the other kind. McDonagh's pithy dialogue sparkles like pixie dust, even in the most minor characters like stoolpigeon Billy Devaney. And yes, everything sounds better in brogue. Writer-director McDonagh takes care to populate what is essentially a genre exercise with an extra layer of faces to talk all that talk. Among these is the sad figure of Gerry's mother, Eileen Boyle (Fionnula Flanagan), a terminal cancer patient. Then there's Inspector Stanton the police official (Gary Lydon), and the goofy guy who likes to show up at crime scenes snapping photos, pretending he's a police photographer (Laurence Kinlan). But the best extraneous character is undoubtedly the little kid Eugene Moloney (Michael Og Lane). Mischievous Eugene seems to pop up everywhere, like a gremlin, grinning at the prospect of finding a cache of assault rifles or furnishing clues to his big pal Gerry. Every cop wishes he had a snitch like Eugene. The McDonagh brothers were raised in South London by Irish immigrant parents and have been batting the mickeys around ever since, John as a screenwriter and maker of shorts. Theirs is the milieu of literate tough guys who can quote St. Thomas Aquinas to you while boxing your ears with a stick. 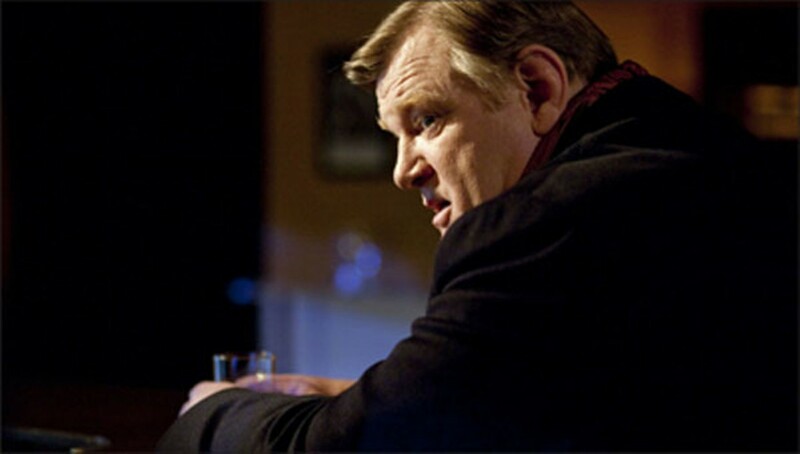 In his efforts to keep up with his prolific sibling, John McDonagh was savvy enough to enlist well-traveled actor Gleeson (Gangs of New York, two or three Harry Potters, and John Boorman's wonderful The General), whose role as Ken in Martin McDonagh's In Bruges is a latter-day pinnacle of harp movie magic. Fifty-six-year-old Gleeson, light on his feet and not quite as bulky as he looks, is capacious enough to build a script around. Once we realize it's his show and that Cheadle's character Wendell is basically Gerry's comic foil, we can let our guard down and laugh at the loose ends conveniently left hanging. In The Guard it's not the trophies that matter, it's the chase.